Claudia Fleming was born on Long Island, New York and dedicated most of her first twenty-five years to the pursuit of a career in modern dance. When Claudia was twenty-one, she moved to New York City where she spent four years working with a small modern dance company. Like many other artistic-minded folk, she made her way to the restaurant world in the early 1980’s to support her career, working in the dining rooms at Jams and Union Square Cafe. She was immediately attracted to both the theatrical and creative aspects of restaurant work. During her tenure at Union Square Cafe, Claudia was a member of the hospitality team and worked at various stations in the kitchen. Claudia gravitated to the kitchen and pastry became her new calling. In 1991, determined to hone her skills, she decided to go directly to the source and study pastry in Paris. After a stint at the prestigious Fauchon, Claudia returned to New York and a new career. Back in New York City, Claudia delved into pastry making at Montrachet, TriBeCa Grill and Luxe. In 1994 Danny Meyer and Tom Colicchio hired Claudia as pastry chef of their new restaurant, Gramercy Tavern – the perfect compliment to their new team. Claudia’s baking style relies on the use of seasonal ingredients. She favors creations that maintain the integrity of each ingredient, and is committed to intense flavor over architectural flights of fancy. Her minimalist sensibility, ironically, allows for maximum flavor. 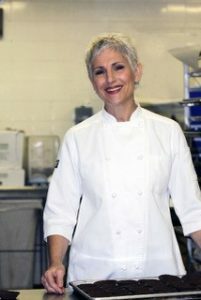 Claudia received the James Beard Foundation’s Outstanding Pastry Chef for 2000. Pastry Art & Design named her one of their 10 Best Pastry Chefs in 2000 and in 2001, and in 1998 Saveur included Claudia in their esteemed “Saveur 100” list. Her work has been celebrated in publications such as The New York Times, Town & Country, Bon Appetit, Food & Wine, Martha Stewart Living, The Oprah Magazine, Bazaar, In Style, Vogue and Self. She was featured on CNN/Time’s segment Innovations: Just Desserts with Bernard Shaw who then won the James Beard award for Best Television Segment. In addition, she has appeared on Martha Stewart Living and The Food TV Network. Her first book, The Last Course: Desserts from Gramercy Tavern, was released in October 2001 and is getting rave reviews. Claudia Fleming and Gerry Hayden who were married in June 2001 decided they wanted to spend more time together, and that naturally meant working together. After Claudia spent time working as pastry consultant to Gramercy Tavern as well as The Red and Cat and the IFC center, she and husband, chef Gerry Hayden relocated to the North Fork of Long Island to open The North Fork Table & Inn. The North Fork Table & Inn located in Southold, NY opened it’s doors in May of 2006 and within a year’s time received accolades from publications ranging from The New York Times, New York Magazine, Food & Wine and Gourmet just to mention a few. The Zagat survey has awarded the NF Table & Inn the #1 restaurant on LI for 2011, 2012 & 2013.